These tips for interior decorating will help you to achieve balance in your home decorating. Balance is what makes a room look finished. 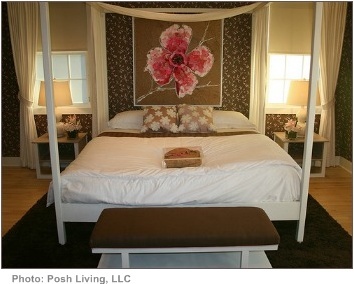 When your decor is unbalanced your room has that “something’s missing” feeling. You don’t require a lot of accessories to balance your decor as long as you understand what balance is and how it is achieved. To demonstrate what balance is in decorating, let’s start by visualising a see-saw. If both people sitting on the see-saw are of equal weight then the see-saw will remain balanced. If one person is heavier then the see-saw becomes unbalanced and dips towards the heavier side. Balance in decorating works on the same principle, but we are concerned with visual weight not physical weight. Symmetrical or formal balance is achieved by “dividing” the space in half vertically, and then having the decor on the right side be a mirror image of that on the left side. The following picture will give you an idea of what this looks like in decorating. Is formal balance for you? 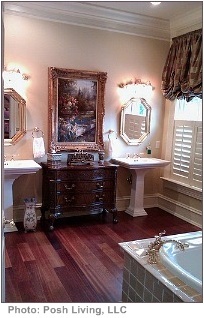 As the name suggests, if you want to give your room a more formal, or sophisticated feel, then use formal balance. If you like formal balance but want a less “stiff” feeling, you can alter the look and feel in two ways. 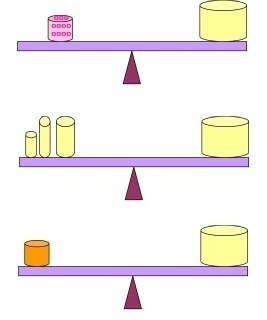 The first way is illustrated in this picture - limit the amount of formal balance you apply. Here we can use identical side tables and lamps on either edge of a two-seater sofa, and use identical cushions on either side of the sofa, then allow the rest of the room to be more informal (no more mirror images). The other way to tweak formal balance is by changing minor details so that the two halves are not exact mirror images. Note the vase placed under the first basin and the window flanking the second. Asymmetrical or informal balance can be achieved in different ways. If we go back to our see-saw example, we can see that the see-saw remains visually balanced even though the objects on either side are not equal. Informal balance can be created by using colour or pattern; by balancing out a large object with a grouping of smaller ones; and by carefully choosing the position you place items relative to each other and the overall scheme. Is informal balance for me? Remember that balance must be created for a pleasing decorating scheme. If you prefer an informal, relaxed look then choose asymmetrical balance instead of formal balance. 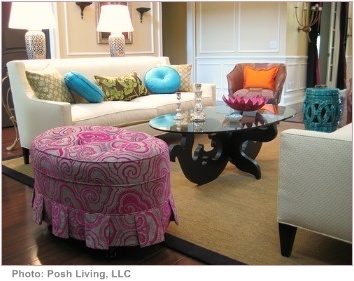 Here a highly patterned larger ottoman is balanced on the opposite end by a plainer-coloured, less patterned, chair and end table. 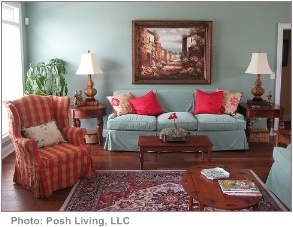 Even though the end table is bright turquoise, it is small relative to the ottoman. 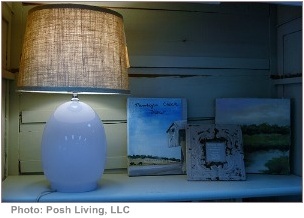 In this collection of accessories, the large lamp is balanced by the grouping of three smaller objects. 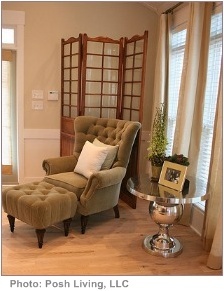 In this picture, the armchair and footrest are the focal point (the point that your eye is drawn to first). Balance is achieved by the careful positioning of the surrounding objects. The wooden screen is large and dark, so to prevent it from becoming too imposing it is placed in the background behind the armchair. To balance such a large piece, the foreground table is very detailed, it is shiny silver and there are a number of accessories grouped together on it. Since it is more visually interesting it draws more attention than the screen and the whole composition is balanced. Practice these tips for interior decorating with your existing accessories and have fun creating a balanced scheme in different ways. Once you get the hang of this, you will see how easy it is to change your decor around and create different groupings that are all beautifully balanced.